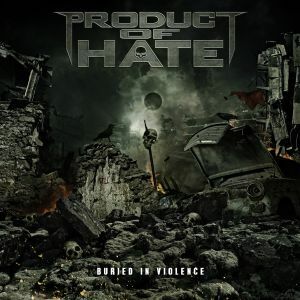 Newcomers Product of Hate, with their debut release “Buried in Violence”, are the heavy and technically ferocious kick in the teeth the thrash metal world has been longing for. “When you see the album art, right away you know what to expect: dark, brutal, and unforgiving,” says vocalist Adam Gilley, who along with Cody Rathbone on guitar, Gene Rathbone playing lead guitar, Mark Campbell on bass and Mike McGuire behind the drum kit will make one hell of a mark with this release and establish themselves a foothold in the metal community. The disc starts off with growling brutality on ‘Kill. You. Now.’, fast, and blackened with that thrash defining double bass drum. Both tracks ‘Monster’ and ‘Unholy Manipulator’ once the vocals kick in have that heavier than early Pantera raw sound that will have you fist-pumping in the air as you bang your head. ‘Blood Coated Concrete’ with mammoth death growls is neck-breaking thrash that will have you will drive a little faster for sure if you listen to this while in your car. ‘Perry Mason’ was really groovy and technical and has a more mellow sound compared to the rest of the disc – I liked it, it showed their range as not just an all-out in your face thrash band.